In a country where very few people would appreciate risking a human life for an animal’s, a brave and kind boy took the initiative to go against the mainstream, guided by his little intuition and loving heart. Ayoub, 13 years old, is Moroccan boy who lives in Marrakech city. 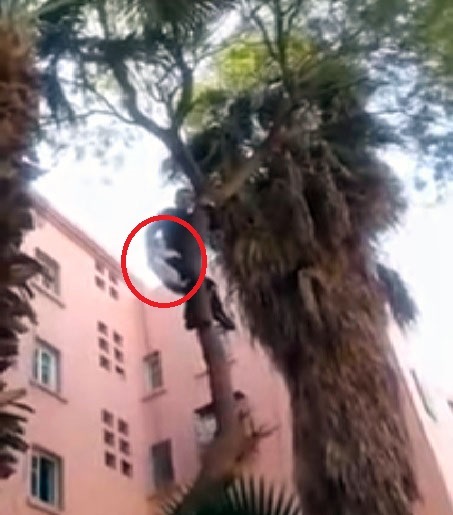 While he and his friends were playing outside, they noticed a horrific sight of a cat hanging down a tree, meowing. The cat looks scary to death and her screaming tells she is in a dire need of help. As the tree’s trunk was leafless, the animal couldn’t climb it down. When it tries to, her little claws slip and show unable to bear her weight. “When we heard the loud meows we turned around to see a cat stuck high up a tree. We looked over each other, and over the helpless cat, knowing not what to do”, said Imad, a friend of Ayoub. “then, Ayoub took the initiative and begun to climb up the tree… I must confess we were scared at the beginning. What if Ayoub slip down, it would be a disaster! Thank god, everything went the right way’’, he added. Ayoub climbed the trunk a bit by bit among his friend’s voices to urge him to stay watchful. He made his way to top relatively easily, but the tough part of the rescue operation was the journey down! He had to bring himself and the cat both safe! But the brave boy could figure it cleverly by making the cat hold on his cloths using her claws! “ Actually, I didn’t have any idea in mind on how to bring the cat down when I started climbing. When I was there in top of the trunk I felt some kind of confused. Fortunately, Imad had the right solution and told me from the ground to let the cat take hold of me”, said the little hero. A hero or a careless boy! The most embarrassing side is probably how the boy is looked to in a different cultural context! Here in US, Ayoub’s brave rescue operation would rank as hero and would be much appreciated, no question about it. But some cultures and backgrounds do not share the same norms. Even if Ayoub received a high appreciation from his friends who witnessed the rescue, perhaps much more from the cat, yet that wasn’t enough to spare him the reprimand from his parents! What would have happened if you had lost your balance and slipped down? a question that will ceaselessly uttered at his face. “ It hurts when you get reprimanded only for saving another life. I know my parents are good and they love me so much and cannot afford to see me taking any risk, less when it is for the sake of saving an animal, any parents would do the same”, said Ayoub. “I feel proud to do that. I’ll never regret it, and if possible, I’ll do it again without thinking twice”.